Stumble-Inn & Stagger-Out - Haga Haga Accommodation. Stumble-Inn & Stagger-Out are two comfortable cottages, which offer self-catering accommodation only metres from the beach. 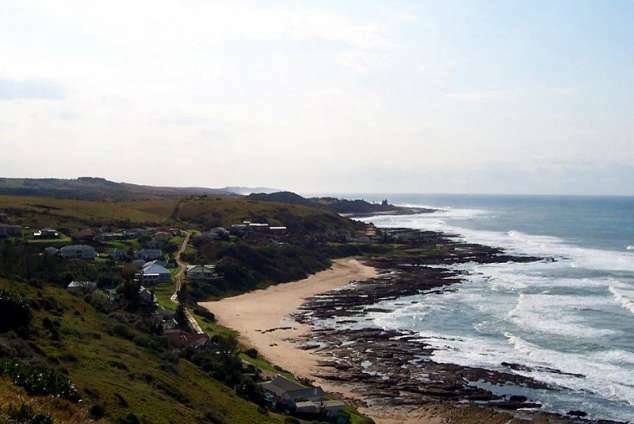 Haga-Haga is a quaint village on the East Coast only 45 minutes drive, north of East London. Stumble-Inn (single storey) has a large lounge/dining room, 3 bedrooms of which 2 have a sea view. There are 2 full bathrooms as well as a large fully equipped kitchen with a stove, microwave, fridge and deep freeze. The main bedroom (with a king size bed) has an en suite and has a magnificent sea view. Bedroom #1 has 2 three-quarter beds with a sea view and Bedroom #2 has 1 three-quarter bed and 2 single beds. With a sleeper couch in the lounge, this cottage can sleep 9 people comfortably. Stagger-Out (double storey) has an open plan lounge/dining room and kitchen, with the 3 bedrooms (2 with a sea view) and a full bathroom upstairs. Another bathroom with a shower, hand basin & toilet is also available. The main bedroom has a king size bed and has a magnificent sea view. Bedroom #1 has 2 single beds and also has a wonderful sea view and Bedroom #3 has a double bed. The kitchen is fully equipped with stove, microwave, fridge and deep freeze. This cottage can sleep 6 people comfortably; however, it is not suitable for elderly folk or tiny toddlers as it has a very steep staircase. All bedding & bath towels are supplied and there is also a washing machine available. Each cottage has its own portable braai, as well as an excellent domestic per cottage that will make your vacation more relaxing. Guests are required to bring their own beach towels. Haga-Haga is the perfect getaway, where well-behaved pets are welcomed. It is a place to relax, unwind & enjoy the ever-changing views of the sea. The fishing is good and the children can spend many hours exploring the wonderful rock pools, swimming & building sandcastles in the sand, while mom & dad can relax and watch them from the front door of the cottages. There are a number of wonderful walks with many beautiful wild flowers, numerous bird species and if you are fortunate enough you see bushbuck grazing on the slopes. For the more energetic, there are tennis courts, horse riding and a mashie golf course, 3km away. Haga-Haga has a wonderful hotel, where you can enjoy a relaxed drink and a meal. For the young at heart, there is "Ninky Noo's" Pub where you can enjoy watching sports & chatting to the locals. 44268 page views since 05 Oct, 2005. Last updated on 14 Jan, 2019.